← How Fast is Earth Warming? Jones based his statement on straightforward analysis of the data and reported his result honestly. 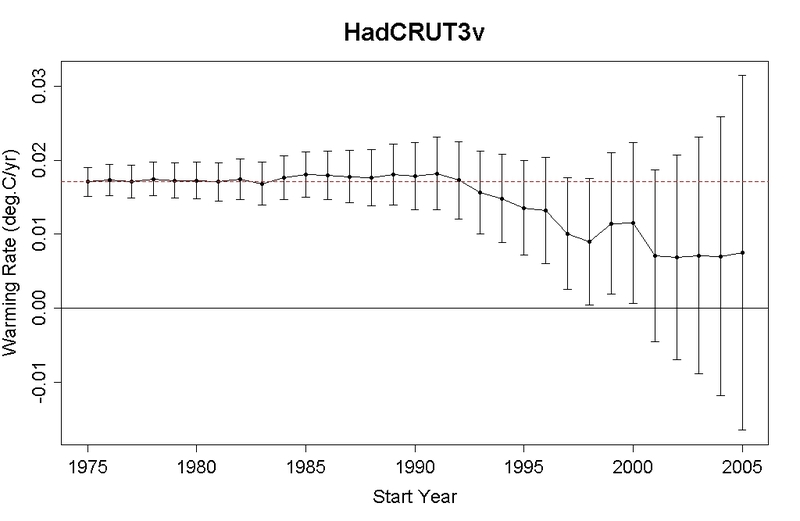 The HadCRUT3v data set (which is from Jones’s institution) shows warming since 1995, but it’s not statistically significant. But then, climate trends over such short time spans (yes, for climate 15 years is a short time span) don’t usually pass statistical significance tests. But by removing the influence of exogenous factors like el Nino, volcanic eruptions, and solar variation (or at least, approximations of their influence) we can reduce the noise level in temperature time series (and reduce the level of autocorrelation in the process). This enables us to estimate trend rates with greater precision. And when you do so, you find that yes, Virginia, the trend since 1995 is statistically significant. And that’s true for all 5 major data sets, including the HadCRUT3v data set from Phil Jones’s organization. Let’s analyze the adjusted (exogenous-factor-compensated) data we got from our last analysis. We’ll first fit a trend line since 1975 to estimate the autocorrelation of the noise. Then we’ll estimate the warming rate (and its probable error) by linear regression on the data from various start years to the present, for all start years from 1975 to 2005. Note that until 2001, the error bars (which are 2-sigma) don’t include the possible value zero. Therefore, until 2001 the warming is statistically significant (using the usual de facto standard in statistics). Not only is the warming since 1995 statistically significant, the warming since 2000 is as well! Certainly, we shouldn’t fault Jones for not estimating the influence of exogenous factors when computing warming rates and their statistical significance. His analysis was straightforward and standard, and his statement was scientifically conservative (which is a common practice among scientists). Just as certainly, we should fault those who claim that Jones’s “not statistically significant” statement means “not warming.” For most of those who do so, it’s not even an honest mistake. Sorry, I know this is an old post but I have to add, I had all out brawl with Lubos Motl, himself, on Peter Sinclair’s youtube channel over this issue. Lubos was literally saying if the warming did not rise to statistical significance then there was NO warming. He absolutely refused to acknowledge that there would be little difference between a 95% confidence level and a 94% confidence level. To say the least, I was utterly dumbfounded. Oh, Rob, I thought you’d posted on the fact that the BBC ran a piece today where Jones points out that as of now, warming since 1995 has passed the 95% confidence level. So now you can take Motl on again, if you … are … the self-flagellating brick wall head bashing type. Yes, that would be interesting. I’ll bet that the “time-to-significance” is trending downwards. 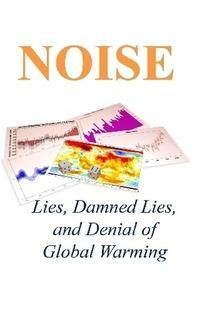 Denialists don’t care about truth. All they care about is political dogma and ideological purity. As I recall even the raw data shows statistical significance now when starting in 1995? 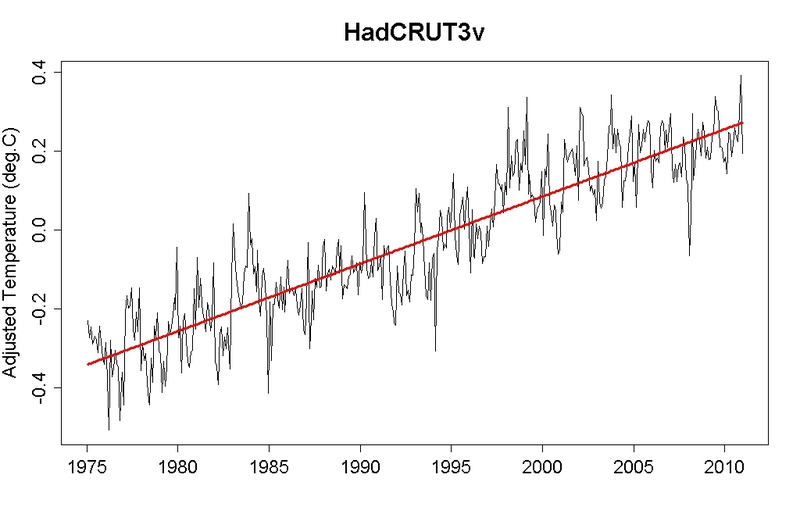 by coincidence, I was wondering aloud on RC yesterday about the Phil Jones quote, and how now that the 2010 data are in, a naive linear fit to the annual means for HadCRUT3v 1995-2010 (inclusive) gives a warming (0.11 ± 0.10 deg/decade ) just barely within the 95% confidence level (p=0.041). Being a Bear of Very Little Stats Skills, that’s about as far as I get. Shall I take it that there is enough auto-correlation in the annual means to nudge the confidence down below the magic 95%? [Response: Yes. In fact the autocorrelation is small enough that you can’t even establish it with statistical significance from such a small data set. But from study of the monthly data, we know it’s there. And by the way, 95% is often thought of as “magic” but it’s actually arbitrary. It’s certainly useful! But it’s not magic. Also take a look at Taminos post How long? Is this current data? It seems to still show HadCRUT3 from 1995 as almost-but-not-quite-significant. GISTEMP is, but Hadley isn’t. Surprised and delighted to see that there has been significant warming since 1998, the cherry-picker’s delight. Bravo! Can you imagine a world where everybody’s biggest character flaws are honesty and naïveté? Yes, it would be a bit like an autism spectrum disorder meeting (which would be both a good and a bad thing). Wouldn’t be surprised if Jones were a sufferer. Could we see the warming rate graphs also for non-adjusted data? Maybe even plotting both on the same graph to see the difference? These recent posts remind me of this post by TreizeVents, a french poster, in june 2010: https://sites.google.com/site/refsdefred/warming-actors. It says a lot about the underlying data that any such treatment, no matter how naïve, yields the same result. It requires some really quite devious sophistry to twist the facts here. Fredt34: are you the ‘Fred’ who translated that page? I was looking for an email address to send a correction and couldn’t find one. In TreizeVents fourth figure, the curve fit to the residual trend is quadratic, not exponential. I confirmed this by reproducing the graphs myself, but it’s also apparent by visual inspection; the trend curve turns up at the left-hand end. I have wanted to ask this question before. I don’t know much stats, and I may frame this poorly, but the question of statistically significant warming is whether you can exclude the null hypothesis of no warming. But if you have a long term significant trend shouldn’t the null hypotheses be that the trend has not changed? Is that sensible and how would you test that? From a purely statistical point of view, one can adopt either choice. Both enable us to estimate the probability distribution for getting the observed result (which is one of the real purposes of adopting a null hypothesis). It’s also important to be aware (statistically, that is) that the null hypothesis isn’t just “trend unchanged” or “trend zero.” It’s “linear trend plus autocorrelated noise” or just “autocorrelated noise.” And we shouldn’t forget that rejecting the null can happen in multiple ways, and rejection only shows that *some* part of the null is incorrect. Since both hypotheses are linear, in this case they end up being tested the same way. If the 95% confidence interval excludes the long-term trend we reject “trend unchanged,” if it excludes zero we reject “trend zero.” Some statisticians reject the idea of hypothesis testing altogether, and just state the confidence interval. And of course, with very short time spans the confidence interval includes both the long-term trend and zero, so we couldn’t reject either null. That’s a sure sign of trying to read too much into a brief span of data. 1. There is no “one true null hypothesis” out there that is logically or empirically determined and if we haven’t proven it wrong it is right. That is to say, don’t get too hung up on it. 2. “Statistically insignificant” does not mean “accept the null.” Statistical insignificance is always achievable, with little enough data, only a statistically significant result tells you something. As Tamino shows, warming over recent years is not statistically significant. And that will always be true, no matter how long it continues warming. 3. For choosing a null hypothesis, I think of Occam’s razor — in the absence of evidence, the simplest answer wins. So a good rule of thumb is, after my hypothesis, what’s the next simplest possibility? (Not necessarily the very simplest possibility — you don’t want to make your test too easy.) So if you’re trying to establish that there is a trend, you test against no trend. If you are trying to show that warming is speeding up or slowing down/reversing, you test against trend unchanged. Funny that so many people claim warming is slowing down/stopping/cooling, but no one ever tries to demonstrate that with statistics. Eric, People get WAY too hung up on the whole “null hypothesis”. Fisher really only introduced it because statistical tests were inherently comparative, and if you were interested in the truth or falsehood of a given hypothesis, there was no way to treat that. All the null does is give you an alternative to which you can compare. In most analyses, it is in fact very unlikely that the null is true. All the failure of a significance test tells you is that your description of the data with your hypothesis isn’t significantly better than it is without. Moreover, the level of “significance” is arbitrarily set usually at 2 sigma, and this also introduces a whole new devil’s playground for dishonest operators like Lindzen to play in. Most of the denialists are innumerate idiots. Those who are savvy, are only interested in lying with statistics rather than teasing out the truth with them. They’re a sad, sad group. [Response: There’s another useful attribute (in most cases) of the null hypothesis: it’s simple enough that it enables us to *calculate* what the probability of various outcomes is. Only then can we evaluate how likely or unlikely a given result is. To wit, those who don’t understand statistics at all, can’t, and those who do understand statistics recall the lawyer’s precept not to ask questions when their answers are likely to hurt your case, and don’t. Just to clarify, is that Tamino’s (No.)? On Kevin’s comment, as a lay person of average intelligence, I was able to use wood for trees to help a skeptic better understand Tsonis and Swanson’s “shift”. Tsonis and Swanson admit the “shift” disappears if one uses GISTEMP. I’m staring to doubt that HadCRUT is the better of two series, and if people don’t present both series in a claim, I somewhat doubt they are saying anything useful; in fact, I’m starting to think they are being intentionally deceptive. “(No. )” was me giving the answer I assume Tamino would give. Ray, agreed, but “2 sigma is arbitrary” is the wrong response to this sort of thing too — after all, even with Tamino’s corrections, warming since 2002 hasn’t been significant at the 1 sigma level, so does that mean it has stopped? The argument I make is, the 30 year trend is significant, so it’s warming, unless you have better evidence. But an insignificant result is not valid evidence for making any case; only a statistically significant result showing that you can put a lower upper bound on recent warming would make that case. You don’t have that? That’s because no one does. Eric L., The point is that the null hypothesis is arbitrary. In practice you never accept the null hypothesis–you merely do not nullify it. After all, even 60% significance against the null hypothesis shows the null is likely not a good explanation either. People need to remember that the purpose of the null is merely a comparison to the hypothesis. Again, this is just something people need to understand about science if they want to get by. Another excellent climate statistics tutorial. Thank you. I have a less ambitious discussion about volcanic dimming, Nino34 and GISS trends here. Your readers may be interested in my CTS.csv file which includes the 5 major global temperature anomaly series as well as Nino34, PDO, AMO, AO oscillations, CO2, SATO, stratospheric temperature, and volcano VEIs. 15 climate monthly time series all in one csv file so that do it yourself climate scientists can learn climate data analysis by doing without having to download and manipulate the source files. If you can give me the link to the solar file you used I will add it to CT.csv so that your readers can have all the data they need to reproduce your analysis in Excel, R or whatever analysis package they prefer. Kelly O’Day – a long time quiet but enthusiastic follower! The thing that needs to be mentioned here though, is that Phil Jones was fielding a laundry list of questions from this BBC reporter. I’m sure he knew the reporter was not asking for an explanation that involved factoring out the various drivers over the last 15 years, though he could well have gone into that if he’d wanted to. He was just answering the question as it was presented, at face value. Jim it’s also true that he was set up by the date being deliberately chosen to show “not quite statistically significant warming”. Phil Jones has participated in several research papers where components for natural internal variability in global temperatures have been deducted, revealing the underlying global warming signal. the El Nin˜ o–Southern Oscillation (ENSO), variations in the advection of marine air masses over the highlatitude continents during winter, and aerosols injected into the stratosphere by explosive volcanic eruptions. ;2–3 months. These coupled fluctuations exhibit a complicated spatial signature with largest-amplitude sea surface temperature perturbations over the Atlantic Ocean. I recommend Figure 12 to your attention. I think it’s just another indication that Lindzen has stopped caring about truth–not a good trait in a scientist. No doubt bods at the BBC read WUWT for anything controversial and to (uhmmm) bring balance to a story. Not that I have a great reason to ask, but would it be advantageous to do your fit on the hemispheric scale first and then combine the two hemispheres? Different lags to exogenous factors in different hemispheres perhaps and a greater cooling effect from volcanoes in the NH. Just a thought? Now that you have removed the exogenous factors can you take the results and use them to estimate a climate sensitivity? It seems like a logical next step. [Response: I’m not doing prediction or extrapolating to the past or future, I’m estimating the trend, so I do use the whole period. The Jones interview is an example of how a scientist can be led by an interviewer — and thereby mislead the public. What it means is that Jones should probably have rephrased the question before he answered it so most people would have a better idea what it really means — and, more importantly, what it does not mean. Most members of the general public have not a clue what “statistically significant” means. In fact, most of them probably ignore the “statistically-significant” part entirely and hear/see only “no global warming”. Either that or their eyes glaze over and they tune out entirely when they hear/see the word “statistic”. He might have stated in simple English that, in general one can’t gauge what is going on with temperatures (increasing, decreasing or remaining flat) over short time periods to the same level of confidence as for longer time periods (a few decades) but that this does not mean that scientists can’t still say with relatively high confidence that global warming has continued since 1995. The level of confidence for “global warming since 1995” is a little less than the normal “standard” (satisfied over the longer term), but not by much and it really should make no difference in the grand scheme of things. FWIW, I think Prof. Jones answered the question exactly as a scientist should, i.e. directly and without hesitating to give an answer which could be viewed as going against his scientific position. Scientists first and foremost are there to advance knowledge in their field; if they are good at comminicating their work to the general public that is a bonus, nothing more. It is unreasonable to expect every scientist to be sufficiently devious to anticipate every way their statements will be misconstrued by an adversarial press that isn’t bound by a duty to seek the truth (rather than controversy). That is an unfamiliar environment for most scientists, and one that most scientists would be keen to avoid given the chance. Prof. Jones wasn’t given much of a choice in the circumstances. Rephrasing a perfectly good scientific question would have been a bad thing to do as it would have led (rightly) to the criticism of evasion. It is a slippery slope from science into rhetoric and I don’t blame him for not taking even the first step (unlike many). BTW many scientists (and even statisticians) don’t fully understand what statistical significance means, it isn’t just the general public. A frog told me that lack of statistical significance means it can progressively get hotter in his pot with no possibility of boiling. He seemed to know about which he was croaking. It is unreasonable to expect every scientist to be sufficiently devious to anticipate every way their statements will be misconstrued by an adversarial press that isn’t bound by a duty to seek the truth (rather than controversy). There’s no need to be devious at all, but maybe the suggestion to “rephrase the question” is misguided, since, as you point out, he was actually providing the best (most accurate) scientific answer to a scientific question. But perhaps he might have gone into more detail about what it meant — and, particularly what it did not mean: that there has been no warming since 1995. The real issue is that the audience for a journalist (and for the scientist talking to the journalist) is primarily not scientists, but the general public. And even then, if all this stuff had no impact on public policy, scientists could stick strictly with scientific jargon and leave it to the journalists and/or the public to figure out what it all means in practical terms. Unfortunately, given that it has a potentially large impact on policy and given all the misinformation being bandied about, scientists have to at least be aware of how their words might be used or even misused. In this case, the words don’t even have to be “twisted” because most people don’t have any idea about statistical significance and almost certainly read “no statistically-significant global warming” as “no global warming”. But I don’t fault scientists for giving accurate truthful answers to questions. The ultimate responsibility lies with those who twist and otherwise misuse what they say. Frankly, I think Jones should not have answered at all. When put in a round room and told to go pee in the corner, you need to recognize the absurdity of your situation. I have to admit that I didn’t immediately read the question as being *that* loaded, it was only when I saw some of the silly interpretations in the blogs… As I said, it is a quite unnatural environment for most scientists. Horatio, sorry, but you miss the point. The BBC did not provide that question themselves. They solicited questions from GW skeptics prior to the interview, and that particular one came from Richard Lindzen via Lubos Motl. They are *scientists* who fed the BBC an intentionally misleading question so that Jones would be made to look foolish in the eyes of the public. The fact that others provide the question is one of the primary reasons for the interviewee (Jones or any scientist) to be circumspect about such a question. That and the fact that the question is not being asked in a scientific forum but one intended primarily for public consumption. Despite the deviousness of the question, it is notable that the papers had to straight out lie about what Jones said to make their headlines. I really wish newspapers let you slap editors every time they lied. It would be a great way to improve journalistic integrity. One way that Jones could have answered simply and accurately, and still convey the import of the trend, would have been to state the probability that the trend since 1995 was not random. If I recall correctly the value that he was working with was 0.94… in that case, telling people that there is a 94% likelihood that the increasing trend is not due to random chance would probably have convinced many people of the nature of what is occurring with global temperatures. Well, 95% is rather arbitrary anyway. Yes. I believe the confidence level from 1995 – 2009 was at least 92%, so it just misses by a hair. Go back just one year and start at 1994, and that pushes it over the 95% mark; the main reason being that 1998 was an outlier that skews the starting portion of the period upwards. Yes, I’ve always hated the language that turns a useful fraction into a binary yes/no. That’s because people leave off the important part. Which is also rather arbitrary. You don’t say quite how you’ve calculated the error bars (apologies if you’ve said it elsewhere and I’ve missed it). Are you taking autocorrelation into account? And is there any dof adjustment for the noise removal? From eye-balling the above graphs for the adjusted data, it looks like the 2-sigma range about the trend starting in the vast majority of the years over the last 3 decades includes a warming trend of 0.2C/decade. Horatio seems to recall a claim (or perhaps two) in the blogosphere of “IPCC Projections Falsified” using 0.2C/decade as the criterion … and a trend starting in 2001. For more of the sterling statistical analysis for which WUWT is known, see here. I’m pretty sure this is the first time (personally) that I’ve seen two WUWT ‘contributors’ having a go at each other. Interesting, because nearly everyone at WUWT has their own little pet theories, and they never seem to point out the problems with each other’s bold statements of ‘fact’ as long as they are anti-AGW. Bob Tisdale calling out this Frank Lansner guy is just so… Pot. Kettle. Black. Hilarious stuff. Tamino, there is one thing that bothers me about this kind of analysis. At one level, the question is the familiar one – how much of the variance can be explained factor x and factor y. However, this approach seems slightly different. A variable is calculated from multiple regression to remove estimated effects of various known factors. Then statistics is calculated on the regression. However, does the estimate of the significance of the regression allows for the error in estimation of the known factors? Something doesnt seem quite right to me. Are you going to publish this? Suppose, as an example, that we removed the estimated influence of some factor but the data weren’t precise enough to determine it. Then the estimated influence would be zero (within the error limits), and we’d effectively be removing nothing, just analyzing the original uncorrected data. In such a case, removing the estimate wouldn’t do any good, but it wouldn’t do any bad either. In fact even if the estimated influence were just noise, it would remove a *false* estimate, and that would make the estimated trend more imprecise. But it would also decrease the *degrees of freedom* in our analysis, and that increase the estimated uncertainty. So, our estimated trend would still be statistically valid (i.e., correct within its error limits). The fact is that the exogenous factors which were removed *do* show a statistically significant response, so they improve the quality of our trend estimate. In fact the trend uncertainty is greatly reduced by removing the external factors. Thanks for that explanation. My first thought was to achieve the same thing by putting the whole thing into a single model, including the trend (another factor) and test significance of the various factors with conventional ANOVA type model. However, I see that this wouldnt help with looking at time range for significance, because you want to use the whole data set to estimate effect of ENSO etc but only part of the data set for estimating the trend. If asked “Do you agree that from 2001 to the present there has been no statistically-significant global warming?”, based on your analysis above is the following answer possible (from length of error bar) and sensible? [Response: Certainly not. For the rate estimate to change as the error estimate grows is expected — the likelihood that the rate estimate will remain unchanged even though the rate remains unchanged is very small. Occam’s razor: warming has continued at the same rate. Likewise, if the rate estimate had *increased* as the uncertainty grew, that’s really not evidence of acceleration — the rate remains unchanged is still most likely. 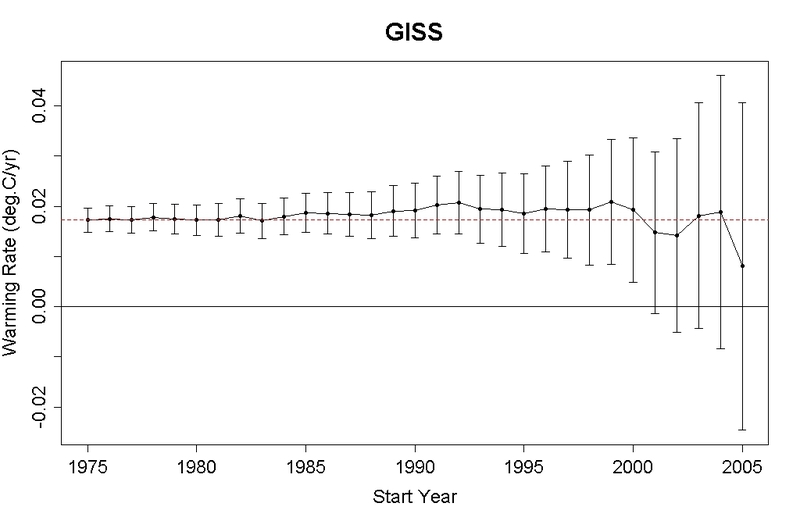 And: I regard GISS data as a more realistic estimate than HadCRU anyway. crandles, You are under the common misconception of what happens as sample size decreases. Your best estimate may well not change or may even increase. However when looking at significance, you are looking at the lower end of the confidence interval. The confidence interval widens on both the top and bottom. Tamino, I see Lucia has a post up about Phil Jones’ latest look at this. Apparently both you and he are wrong. Somehow, Lucia’s analysis doesn’t seem quite as comprehensive as your own.